Actor Jussie Smollett after his court appearance at Leighton Courthouse on March 26, 2019, in Chicago, Illinois. Prosecutors have dropped the charges against Jussie Smollett — a Black gay man and a star of the Fox series “Empire” — but that hasn’t changed the extrajudicial verdict already reached by mainstream media, the Chicago Police Department (CPD) and the mayor of Chicago. Meanwhile, President Trump has now taken the irregular step of declaring that the FBI and the Justice Department will review Smollett’s case, despite local prosecutors’ decision to drop the charges against him. The fact that Smollett, who was accused by the CPD of having organized and paid for an assault and battery against himself, continues to maintain his innocence is being swept aside. Few seem to care that his guilt has not been proven as is required by law. He is guilty! Case closed! Chicago’s police and mayor continue to deny Smollett the presumption of innocence. 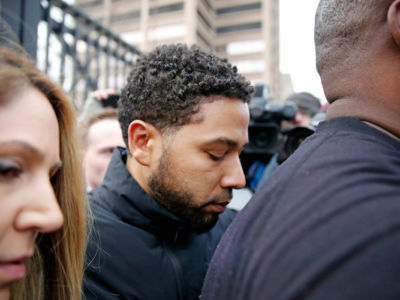 Seeing that the CPD and the international mainstream media declared Smollett guilty before he could have a day in court, the dropping of charges against him has done little to change their verdict. Meanwhile, the lead prosecutor is continuing to stoke efforts to try Smollett in the court of public opinion rather than the court of law by telling media that he still thinks Smollett is guilty, even though he decided to drop the charges against him. The CPD had leaked so-called evidence that was supposed to be the result of a thorough investigation to establish his guilt in the public eye. He was not simply accused — he was judged guilty by innuendo by CPD Superintendent Eddie Johnson. And the motive of the alleged crime, according to the CPD, was to boost his salary, keep his job and boost his celebrity. I have carefully studied a 22-page “Chicago Police Department Case Supplementary Report” released to the Chicago Tribune by the CPD on March 28, and from this excerpt of the narrative and physical evidence allegedly taken to the grand jury, it appears that the files largely contained what had already been leaked to the press. The Chicago Police Department and international news media have closed the case on Jussie Smollett. But what are the facts that are known? The story that Smollett was motivated by salary negotiations was declared by CPD Superintendent Eddie Johnson. However, Fox executives have publicly declared that there have never been any plans for negotiations regarding Smollett’s salary, and that Smollett had not raised this issue with them. Johnson then changed the story to say Smollett was motivated by a desire to bring attention to himself as a victim of a racist, homophobic attack because he was about to be dropped from the program. Both Fox executives and the show’s writers have publicly contradicted that claim. Next, Johnson showed news media a threatening letter that had been given to them by Smollett and declared that the actor had written the letter himself. The FBI, which has entered the investigation, released a statement criticizing Johnson for making such a statement without any evidence. Johnson stated that two brothers, Olabinjo (“Ola”) and Abimbola (“Abel”) Osundairo, were paid $3,500 by Smollett to stage the attack. “Anonymous sources” within the CPD told news media that the brothers have told them that they purchased rope and other paraphernalia under Smollett’s instructions. Surveillance video shown by CBS 2 Chicago shows them purchasing ski masks (not rope). The CPD reports on the case suggest that the brothers admitted they bought the rope. Schmidt says that the brothers understood the check they received was for security training. They had been hired to provide security services and training to Smollett. Schmidt says the brothers may have performed the attack as a favor to the actor, not for money. They have also publicly apologized for their role in the situation. The brothers released a statement declaring that they are neither racist nor homophobic. However, workers on the set of “Empire” report that they have heard Abel make numerous homophobic comments, and The Blast has found homophobic tweets by Abel. Meanwhile Smollett has told his family, police and other associates that he is certain that at least one of his assailants was white. He saw enough through the ski mask he was wearing to be certain of that. The accent of immigrants from Nigeria is not one that could be mistaken for that of a white, English-speaking American. Cook County State’s Attorney Kim Foxx had withdrawn herself from involvement in the case, citing contact she had with Smollett’s family. She would never have gotten involved, she told reporters, if she had thought that Smollett would become a suspect and not a victim. The FBI is also involved in this case but has released very little information regarding its investigation. Jussie Smollett still maintains his innocence, and according to him and his lawyers, no deals were made for his release. Nor has he done or been ordered to do any community service. There is no written, open or hidden agreement between Smollett and the state’s attorney’s office compromising his claims of innocence. It is perhaps indicative of the inherent biases concerning Black and gay people that there has been an unquestioning acceptance of the police story about this incident by the news media. Even many Black and gay activists — the same people who distrust the police on every other front — have also accepted the police story on this incident, perhaps in a reflection of internalized racism and homophobia. The recent public display of righteous indignation on the part of Mayor Rahm Emanuel and top cop Eddie Johnson notwithstanding, those of us who live in the Black and Brown communities of Chicago can attest to the fact that the intensity and alleged commitment of resources to the investigation of Jussie Smollett is not what we normally see. How do you justify committing such “enormous resources” to investigating a nonviolent, class 4 felony? The record of the CPD for covering up police crimes is voluminous, from the murders of more than 153 Black and Brown men in the last nine years to the documented attempted cover-up of the murder of Laquan McDonald. Why is the CPD so readily accepted as infallible when the subject is a young Black gay man, a likely victim of a racist homophobic attack? Over 70 percent of the homicides in Chicago remain unsolved. We now know that many of the homicides “cleared” by the police were done so by extracting false confessions through physical and psychological torture of suspects. This means that their “clearance” rate is even lower than that reported. Yet the CPD was able to charge Smollett with engineering a hate crime against himself in a matter of a few days. The importance of this case to our movement for real police accountability (i.e., community control of the police) can hardly be overstated. Now Donald Trump is promising federal review of the Smollett case. We understand Trump’s motive: He stands with the police no matter what. But what is truly disturbing is the uncritical readiness of so many others to accept the word of the corrupt and racist criminal justice system that exists in Chicago. The response to Smollett is yet another example of how our society embraces police-state-like practices that simply presume guilt when it comes to Black, Brown and LGBTQ people in the United States. Frank Chapman was wrongfully convicted of murder and armed robbery in 1961 and sentenced to life and 50 years in the Missouri State Prison. His case was taken up by the National Alliance Against Racist and Political Repression (NAARPR) in 1973, and in 1976 he was released. He had been incarcerated for 14 years. In 1983, he was elected executive director of NAARPR. He worked with Charlene Mitchell, who preceded him as executive director of NAARPR, on building an international campaign to free Rev. Ben Chavis and the Wilmington Ten, Joann Little, and others falsely accused and politically persecuted. He was a part of the international campaign to free Nelson Mandela. He has been a part of leading the struggle in Chicago for the past seven years to stop police crimes — especially murder, torture, beatings and racial profiling. He is presently co-chair and educational director of the Chicago Alliance Against Racist and Political Repression. In addition to being a community organizer Frank is also a published writer since 1971, when he first published “Pages from the Life of a Black Prisoner” in the Fall 1971 edition of Freedomways magazine. He became a contributing editor of Freedomways magazine in 1981-83. Racist Anti-LGBTQ Violence Is Real. Smollett Doesn’t Change That. Too much focus on Jussie Smollett distracts from the fact that violence against LGBTQ people of color is rising. Jason Van Dyke is just the tip of the iceberg. A history of the movement to make Chicago pay for the crimes of Jon Burge.